Triple Gooseneck Dashboard Mount Doesn't Seem Distracting At All | OhGizmo! 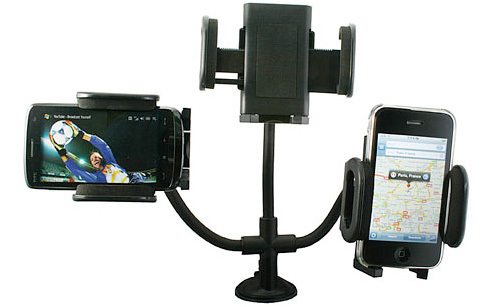 On one hand this triple gooseneck mount looks like a pretty handy way to have easy access to your phone, GPS device and MP3 player while driving, but on the other hand, how can having this thing suction cupped to your dashboard or windshield NOT be distracting? Each of the device mounts can rotate 180 degrees, facilitating landscape or portrait views of the displays, and the flexible arms can be adjusted and positioned as needed. $29.99 from USBFever.com. At Christmas time you could decorate it with lots of lights and ornaments…and tinsel, can't forget the tinsel that you'll be picking out of every crevasse for months after. I see it as kind of a way to make it even less distracting.